As you well know, dear readers, this is a site for board, card, and other tabletop gaming. 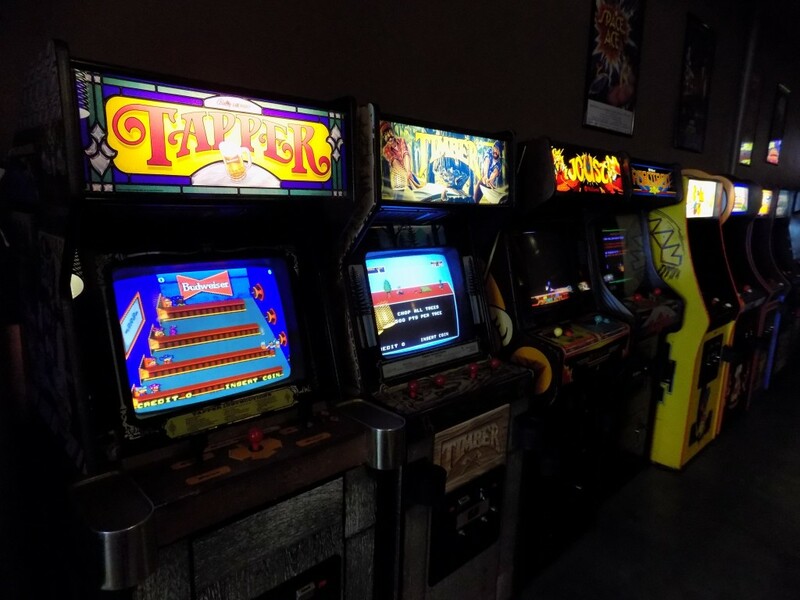 However, on my journey through the Pacific Northwest, I spent some time in Salem, the capital of Oregon and had the good fortune to walk in a barcade named Coin Jam and simply had to tell you all about it. 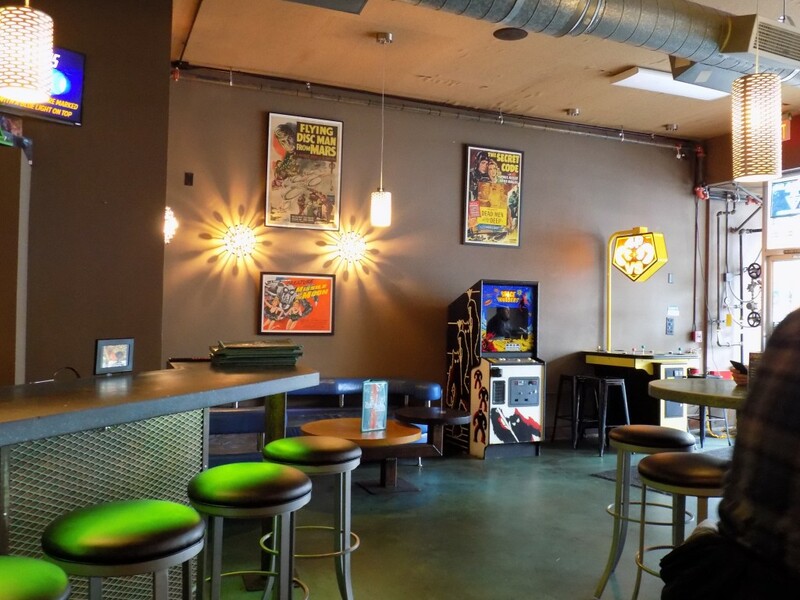 Similar to game cafes, barcades are a growing industry in the United States, blending the adult comforts of a bar with the fun memories that many of us have of the arcades of our youth. These places hearken back to a time when video games were a more communal experience. Not just in the sense of competing over a high score, but in the groups of friends huddled around a favorite machine- either playing together or cheering on a skilled player. Coin Jam captures this vital, electric feeling from our childhood and brings it into a new, adult age. Upon entering Coin Jam, my first impression was that I was in a small, albeit sleek, bar and restaurant. Walking past a Space Invaders cabinet and having a seat, I admired the pervading theme of geekiness that adorn the walls. From the televisions that do nothing but play commercials and movie previews from the late 70’s through the early 90’s, to the walk-in fashioned to look like Han Solo encased in carbonite, to the framed internet memes informing customers of the various policies of the establishment, I immediately felt at home. 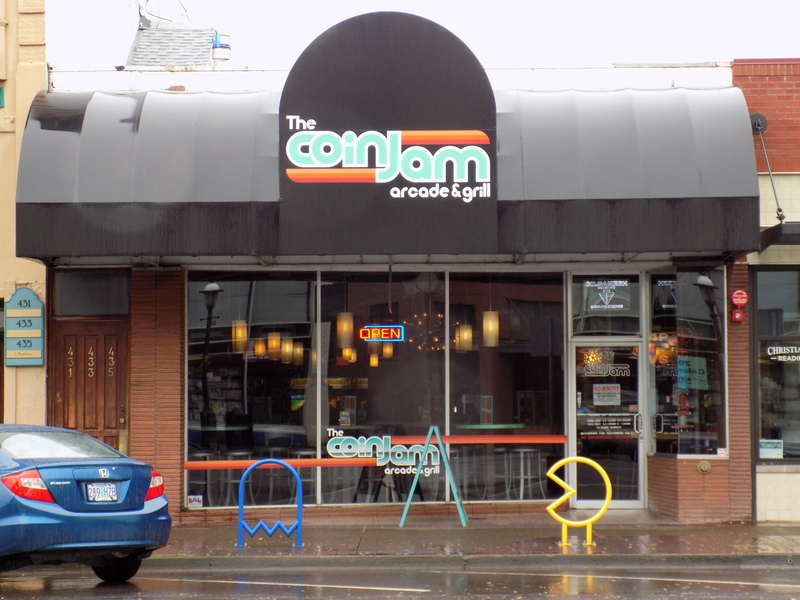 And Kyle’s passion wasn’t singular at Coin Jam– from the customers I was lucky enough to speak to, to the waitstaff- everyone in the place clearly loves Coin Jam. But let’s get to what I’m sure you’re really excited about, the games themselves! 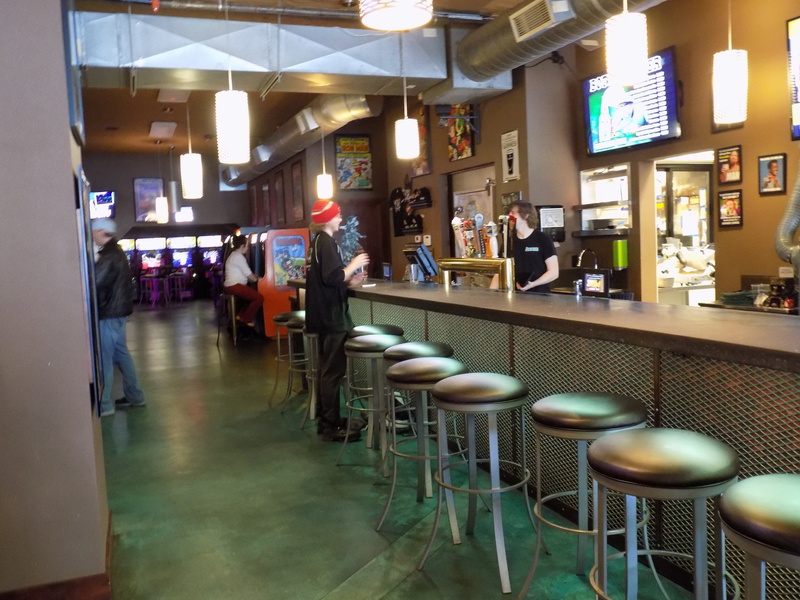 As you walk further into Coin Jam, just beyond the bar, the arcade proper begins. 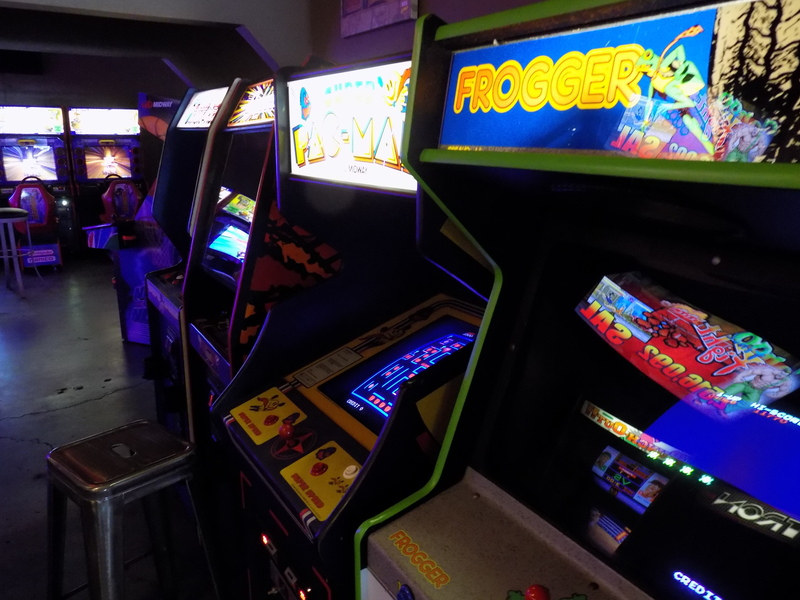 Immediately, you’re flanked by the classics of video game history- Donkey Kong, Mario Bros., and Frogger sit across from Galaga, Joust, and Pac Man. 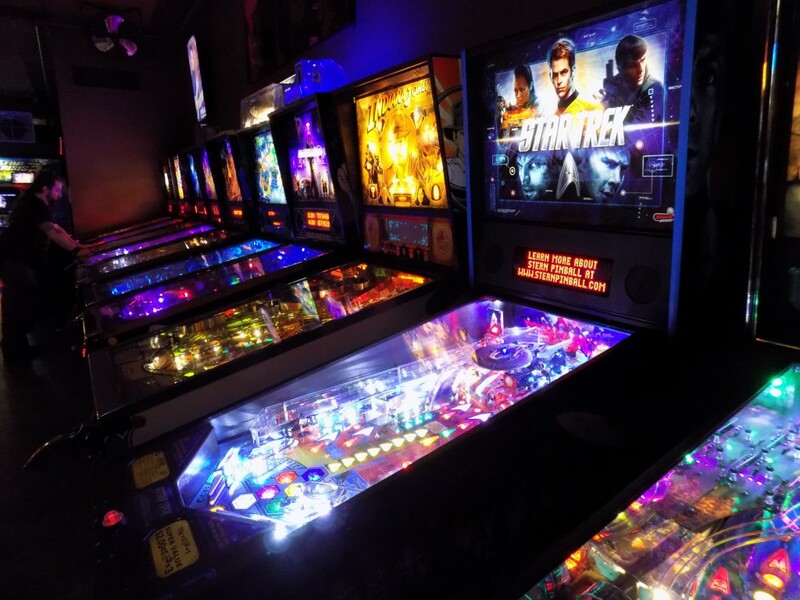 Further in, an impressive row of pinball machines glow and jangle, the rhythmic thumping of flippers add an intoxicating staccato to the hubbub of the machines that you pass. And, I must say, at Coin Jam there is an impressive variety of games from old classics to newer titles. Sean filled me in on the backstory of how he and the owner, CJ Nelson, opened the place in July 2013. “CJ needed a place to put all these arcade games and action figures he had collected. He talked to me about maybe opening up a museum that was combined with a coffee shop. The concept evolved over time- until we got to where we are now- a place that offers something other than a place to drink and stare at each other.” CJ’s love of the arcade is evident- not only Sean, but also some customers told me about how he comes in several times a week, checks on how the games are working, and swaps out those that need repairs with others from his warehouse and workshop. CJ works constantly to repair these older games that in some cases have taken decades of loving abuse from players. For two years in a row, Coin Jam has won the accolade of Salem’s best downtown bar- and it is easy to see why. The dedication and love of its staff and owner is plain for anyone who walks in to see. The food is excellent and lovingly crafted, the selection of games will keep you entertained for hours, and the staff is friendly and welcoming. There are even events where they’ll plug in a couple consoles into a pair of projectors and hold massive tournaments- such as their recent 64 person Mario Kart tournament- with prizes awarded to the top competitors and several arcade cabinets set to a free play mode for those not competing. If you happen to be in Salem, I can’t recommend Coin Jam highly enough- it’s a great place for an afternoon or an evening. If I could have spent a whole weekend there, I would have, I assure you. 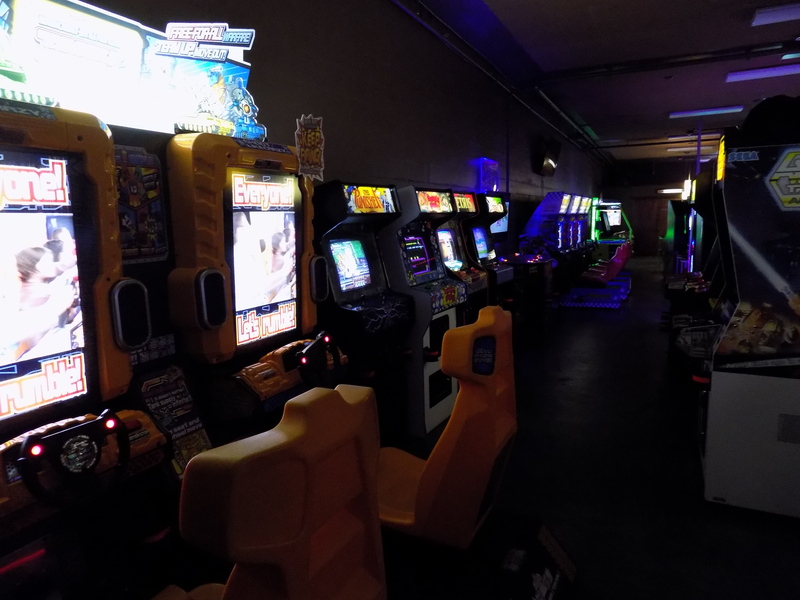 So if you’re a gaming veteran, or just one curious about its roots and are in the Salem area, be sure to check out Coin Jam– your pockets might be a little lighter from a loss of quarters, but the experience and the atmosphere are most definitely worth it.